This sand and soil blend is passed through a steriliser unit and then over a 3mm screen in order to produce a pebble free, sterilised product with a moisture content in the range 1-2% w/w. As such, this type of material is in ideal combination for applying to fine turf surfaces, such as golf or bowling greens, using standard top dressing spreading equipment. We produce two standard percentage by volume blends, namely 70/30 and 60/40, Other blends can be produced by Request. One of the most important secrets to achieving a golf course quality lawn is top dressing your lawn at least once a year. Top dressing involves laying down a new fine level of blended top dressing mix on top of your lawn. Top dressing can also be used to level your lawn, eliminating depressions and bumps. 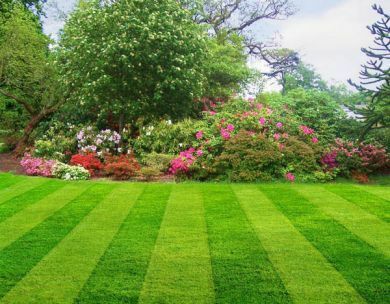 It stimulates the growth of new blades of grass and makes your lawn look denser and greener, this new growth will help to eliminate weeds and moss. The best time to top dress your lawn is in autumn, because your grass will have the opportunity to grow through several mowings before the cold of winter sets in. If your soil is heavily compacted, it is a good idea to aerate it several days before applying the top dressing. This can be achieved by inserting small spikes in the soil and then removing them. Apply the top dressing mixture with a garden spade about 1.4Kg of top dressing per Square Metre. (1.4Kg/M2) add more if the surface is uneven and you are seeking to level it. Once down on the ground, you can spread the top dressing around with the back side of a rake or with a specialized tool called a lute. This will also work the top dressing down into the soil. Make sure not to leave surface bumps and to fill in all of the hollows. Continue spreading until the peaks of the grass again emerge. You can use the sharp side of the rake to "comb" the grass so that it returns to its normal attitude. Now it is a good idea to thoroughly water your lawn and then let everything set for a couple of days. Then you can go back with your rake to spread the top dressing around again. This will smooth out any hollows or bumps that develop. If there are any bare spots, this is the time to plant new grass to cover them. Follow this procedure once a year, and you will have a brilliantly green and healthy lawn your neighbors will admire.